Curated by Ara Qiu, 「……I……」is an interactive site specific performance conceived by the RU artist Lin Jingjing where a group of performers read out loud and in cadence excerpts from speeches delivered by Donald Trump during his presidency where all the text has been removed except for the pronoun “I” and emphatic words such as “great” and “huge”. The rhythm of the performance is controlled by a metronome activated by the artist. 「……I……」brings to the surface emerging conflicts and confusions that rise against the backdrop of current political and cultural situations. Together with the artist, performers will interact through simple and poetic body movements and vocal performance with the audience and their surroundings. 「……I……」is the fourth iteration of a socially-engaged art project presented by Lin Jingjing in Beijing (Chinese version, Whitebox Art Center, 2011), Santiago (Spanish version, Chilean National Museum of Fine Arts, 2011) and Cologne (German version, Neues Kunstforum, 2012). 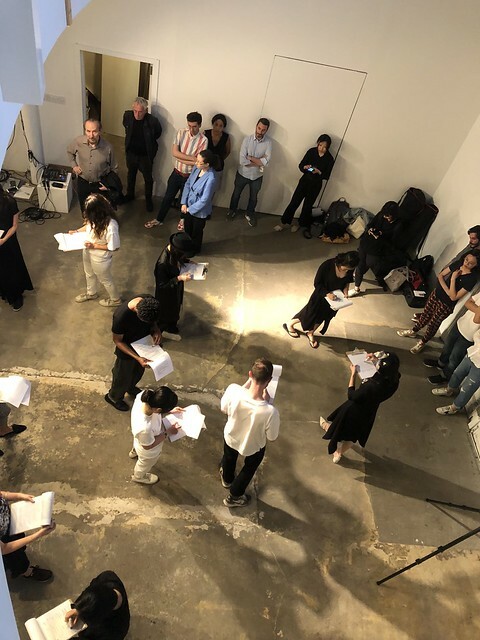 The English version of this project is conducted during the artists’s residency at RU in New York in June 2018. *The performance will last about 20min, and will be followed by an open discussion and Q&A with Lin Jingjing and Ara Qiu. RU curator in residency Ara Qiu is based in Shanghai, China where she works as a curator for TANK SHANGHAI From 2015 to 2017, Qiu worked as a curator at the Long Museum, a leading private museum in China where she served as the Project Manager for the exhibition James Turrell: Immersive Light (Jan 22-May 30, 2017), which is the most comprehensive retrospective of the artist in Asia to date. This program is made possible with support from Best6.